Yeah, I’m writing about the election, but I’m not talking about politics. “Election but no politics?” you say, “Russell, you must think we’re fools!” First of all, I would never think of you as a fool (unless you put effort into it), and second, I’m talking about the mechanics of the election, not the politics of the event. So fear not! There will be no political analysis (or whining). There is an acronym used by marketers: SEO. It means Search Engine Optimization, which is a fancy way of making sure a web page can be found on Google and other search engines. The simplest trick is knowing keywords used when users are searching for a site. I originally wrote this post on election day (Tuesday May 14, for those who missed it) when I realized that I had misplaced my voter information card, so I did not know where to cast my vote. I opened my web browser and Googled “where do I vote”. Nothing. “where do I vote victoria bc”. Nada. “Where to vote”? No results. I tried a dozen combinations of search terms. None of the search results told me what I needed to know. The only Elections B.C. page that came up was their voter registration page, which did not contain what I needed to know. My next step was Elections B.C.’s website. Oddly enough, there is a page called “where to vote”. When I searched that exact phrase on Google, that page did not show up. Google does not know that page exists. Anyone using Google will not know that it exists. So how does this relate to SEO? Elections B.C. does have page to help find voting stations, but Google could not find it. Elections B.C. has a tough job. They need to ensure that voters do their part and vote, especially younger voters as they have not been showing up for last two elections. However, lazy and/or nonexistent SEO is not going to help. 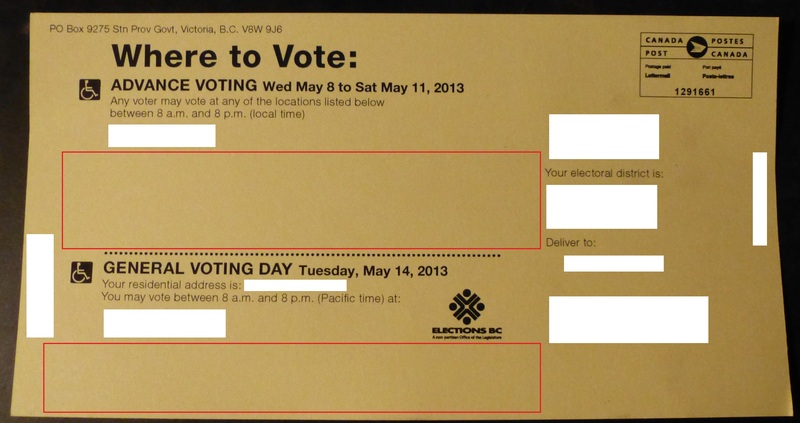 Approximately 52% of eligible British Columbians went to the polls last Tuesday. That’s 1% more than the previous year, and the number may increase: there are still ballots to be counted from those of us who went to the incorrect voting station. Regardless, 1,629,422 out of 3,116,626 is not a great turnout (data courtesy of Elections B.C.). The last one is by far the most common, but I’m not soap-boxing about why people don’t vote. An election is an opinion-voicing mechanism: say who you want to govern, but it does not capture the opinions of those who do not vote. There is no empty circle where I can mark “abstain”, nor explain why I did not vote. Mind you, I doubt anyone wants to go to a voting station just to say “no”. So how could Elections B.C. measure the non-vote? Blank space. So much blank space. Oh, and whited-out important details: sorry, cyber-stalkers! Is it as easy as that? Probably not, but that’s the best my father and I can come up with. What do you think? Comment below about how you think the non-vote could be measured!